Valentine’s month has everyone swooning over roses and chocolates. Few remember the tantalising kick of the chilli’s lovebite and the role it plays in romance. Chillies are the perfect Valentine’s food for a multitude of reasons, all of which contribute to a hotter, spicier, happier Valentine’s meal. Interestingly, chilli peppers are not actually peppers. They belong to the capsicum branch of the plant family, which includes the potato, the aubergine, and the tomato. Their cultivation stretches back as far as 9 000 years to Mexico where the first wild varieties were used. The Spaniards and Portuguese introduced the chilli to the rest of the world in the mid-15th century, only 200 years before the era of Romanticism, throughout which, chillies were relished. Their rich history brings them to us today. Love them or hate them, they’re not just a taste sensation. They’re packed with nutrients. The hottest health food is a Valentine’s must! Have you ever wondered why “heat” is such an important factor in chillies? Not only do they add ‘zing’ to your palette, but the tingle they offer also boasts aphrodisiac properties. While they’re the perfect way to spice up a romantic Valentine’s menu, chillies offer health benefits too. When the capsaicin is eaten it stimulates the brain to release endorphins into the bloodstream, creating a natural high similar to that which athletes experience. Is there any better way to add some spice to a romantic meal for two? If you’re not acclimatised to the burn, there’s an easy starting point. Not all chillies are suicidally hot and beginners should start with milder varieties. A burning mouth and streaming eyes are not romantic. Start with varieties like Anaheim or Fresno, which produce only a mildly tangy and tingly sensation in the mouth. While you’re building your tolerance, be sure to test the chillies before adding them to your cooking. Certain species may be hotter than others but this is never a guarantee, each chilli can vary greatly in pungency – even chillies harvested from the same bush, so be sure to test them out. The tip of the chilli is its mildest point so test it by cutting off the tip to taste it cautiously. Reduce the burn by removing the seeds and membrane and just use the chopped flesh. Alternatively, add a whole chilli during cooking and remove it when ready to serve. Remember to rinse your hands and your chopping board carefully to prevent cross-contamination into others foods. You don’t want an unexpected surprise later! Chillies are easy to grow, which means spicing up your February is straightforward. Growing your own chillies adds that personal touch to the meal. Love is really just a series of small and thoughtful gestures that communicate affection. Here is one loving gesture that will add to your garden, your kitchen, and your relationship. – Watering is critical because if chillies wilt, they tend to drop their flowers, and that means no fruit. – Feed your plants monthly with any pot plant food, and harvest the chillies when they turn red or yellow. – Chillies make beautiful and dainty little tree-like plants. One small tree can offer enormous harvests, for its size. – If planted in pots, use the normal commercially available potting soil. Pots should not be smaller than 20cm in diameter, bigger is better. Water daily, especially those in pots, and when it is very hot, this can be increased to twice a day. – Chillies do not grow well indoors because they need to be pollinated by bees and other insects. It’s better to bring a pot indoors for a special occasion and then take it out afterward. – Compact varieties like Fiesta, Aquille or Habanero make cheerful container plants or decorative borders. Larger varieties like Jalapeno, Fresno, and Serenade, add colour to herb and veggie gardens. Add a little spice to your relationship with a combo pot, or a love garden. Since it’s the season of romance, there’s no better time to start! Think about the herbs you use in your spouse’s favourite dishes, and plant up your herb pot accordingly. A love garden communicates your affection for your partner, it requires daily tending and care. Harvests can be made on special occasions, and none could be more romantic than Valentine’s Day. Incorporate chillies in your love garden for a little extra kick! One example of a love garden, or a combo pot, is a Tangy Thai pot. It has one or more chillies as the main plants alongside Vietnamese coriander, lemongrass and lots of garlic chives for a wild combination. Plant them in an old drum, bucket or steel dustbin and paint it silver if it needs a bit of sprucing up! If you’re still looking for great recipes that will spice up the romance without causing a sweat, try our cheesy spinach chilli bites. 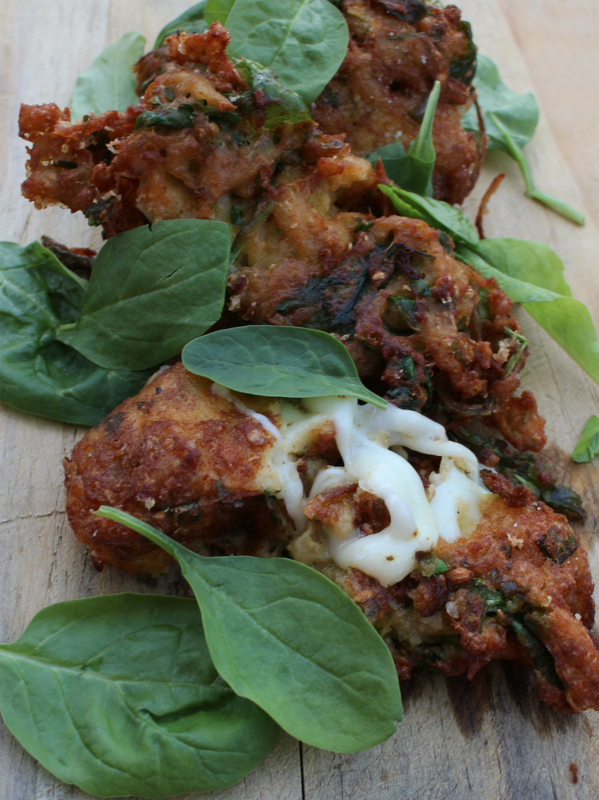 Make your own baby spinach chilli bites and add a glorious melted mozzarella centre. In a food processor pulse together chillies, onion, coriander seeds, cumin, salt and paprika. Add chickpeas and blend into a paste. Place this mixture into a bowl and add potato, flour, baking powder, egg, coriander, spring onions and baby spinach leaves and mix well. Dip the mozzarella batons into egg and flour and then into the batter, making sure they are covered well before dropping into hot oil to fry until crisp. Serve immediately just as they are, or dipped into a sour cream and mustard sauce.